and recipe courtesy Campbell’s. We’ve been playing around with puff pastry this week, and are making these Thai Shrimp Spirals to go with the Champagne tonight. 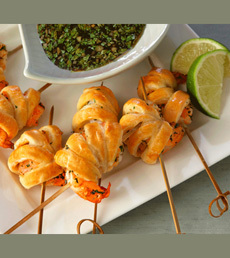 Marinated shrimp wrapped in tender puff pastry and served on skewers with a dip, they’re a fun and tasty food. Prep time 30 minutes; total time 1 hour 40 minutes, which includes 40 minutes of thawing time. Suggested serving size: 2 pieces. 1. GRATE 2 teaspoons zest and squeeze about 1/4 cup juice from the limes. Stir the zest, juice, cilantro, garlic and ginger in a small bowl. 2. PLACE the shrimp into a medium bowl. Add 1 tablespoon soy sauce and half the lime mixture and toss to coat. Cover and refrigerate for 10 minutes. Reserve the remaining lime mixture for the dipping sauce. 3. HEAT the oven to 400°F. Beat the egg and 1 tablespoon water in a small bowl with a fork. 4. SPRINKLE the flour on the work surface. Unfold the pastry sheet on the work surface and roll into a 10-inch square. Cut into 20 strips, about 1/2-inch wide. 5. SKEWER each shrimp with a wooden skewer. Starting at the top, wrap 1 pastry strip around each shrimp, slightly overlapping the pastry and ending just before the tail. 6. PLACE the skewered pastries onto 2 baking sheets. Brush the pastries with the egg mixture. Bake for 15 minutes or until the pastries are golden brown. Let the pastries cool on the baking sheets on wire racks for 5 minutes. 7. BEAT the reserved lime mixture, remaining soy sauce and water, the honey and sesame oil in a small bowl with a fork or whisk. Serve with the pastries for dipping.